This showy succulent type plant has a beautiful flower spike that can grow to 7′. 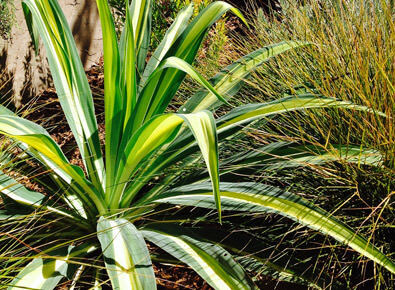 I love to use this plant in the landscape because it also has very dramatic yellow striped leaves which are soft and bright. It is very versatile and can be planted with other succulents or natives or stand alone in a rock garden. It is easy to grow as it likes less water and well drained soil. It can also be planted in a large container to accent an entryway, hill side or succulent garden. This mexican lily is not that available but can be ordered from your local nursery. It makes a unique accent in your garden! This succulent comes in many varieties. Some large and prickly like the century plant and some much more compact and smoother leaves. 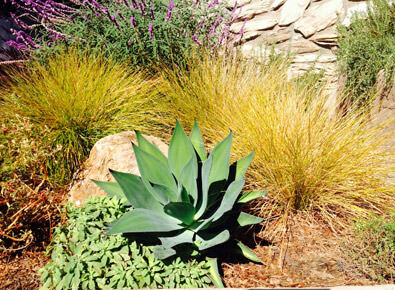 The latter I like to use because they are showy, easy to grow, and look great with many drought tolerant plants like natives and succulents. 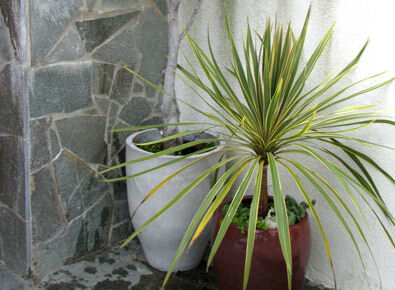 This Palm -Like plant is one of my favorites for using as a container, accent plant. There are many varieties to choose from and can be found at most nurseries. If you want a specific variety it usually can be ordered. It is easy to grow in part sun ,part shade with average watering and looks great with its arching leave of brilliant reds. Planted with small succulents like sedums spilling over the edge of a bright glazed pot really makes it stand out. It looks great around pools or to accent an entryway. Make sure to check the zone you live in for best results.